The news we hear on the street is that The Peace Arch City is changing rapidly with new growth and potential prosperity after years of absence. Newspapers and city hall meetings have discussed the pros and cons of the growth issues and we now are hearing that a moratorium might be in the not too distant future so we have time to plan the direction and type of progress we desire. We have seen a recent rapid rise in the home prices and of large and small vacant tracks of land. In any event our prosperity certainly seems evident in the fancy new homes and cars in the driveways. The downtown scene seems to also be changing for the better with new multi storied buildings for businesses and residences on the drawing board. A boardwalk that is multiple blocks in length with an unobstructed view of the waterfront, Semiahmoo and White Rock is also planned. 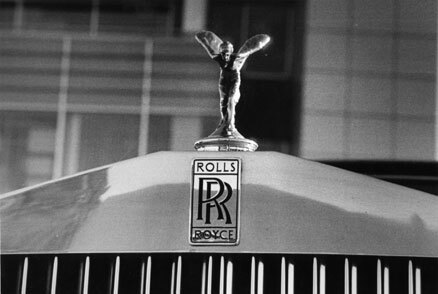 On our roads we are seeing much more traffic and a wider variety of vehicles parking in our street and lot spaces This beautiful winged hood ornament on a Rolls Royce, the most elegant of cars, now marks it's own space with a touch of class reinforcing the notion that prosperity is right in front of us.